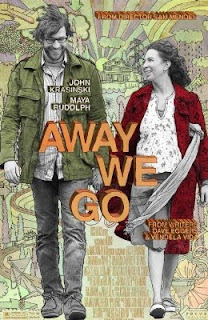 Away We Go is a nice little piece by Sam Mendes, director of critically-acclaimed films like American Beauty, Road to Perdition, Jarhead, and Revolutionary Road. It's a nice little departure from his normal films and very refreshing. The film is about a couple, Burt and Verona, in their mid 30s trying to figure out what to do with their lives when Verona becomes pregnant. Still leading college student lifestyles, they realize the need to change their lifestyles and environment to welcome their newborn baby. What follows is a trip across North America to visit friends and family to hopefully find the ideal place to raise their kid. Through these colorful characters and interesting encounters, they reevaluate their lives and their own relationship. Their tones are playful, yet they are serious at what they are looking for. The movie is funny and touching, and the characters are extremely natural in their roles. It also has nice supporting cast, including Jeff Daniels playing Burt's dad and Maggie Gyllenhaal in a very memorable part as Burt's childhood friend.